Zombie research on the potential of a massive zombie outbreaks has become an important focus of science and medicine recently. Zombies are known as biters, cold bodies, creepers, dead ones, floaters, geeks, lamebrains, lurkers, monsters, roamers, rotters, skin eaters, and walkers, according to the historical TV show The Walking Dead. Other historical documents have called them Zeds, Zs, Zekes, and ghouls. it is biologically infected and can pass that infection to healthy humans. Recently, a researcher on the science of zombies, Tara C Smith (see Notes 2 and 3 ), an associate professor of biostatistics at Kent State University, published a review article on zombie epidemiology in BMJ, which examines the history, epidemiology, prevention, and treatment of zombie infections. I will endeavor to review some of the more important points as a service to my loyal readers. The oral and written observations of zombies go back to the 16th century. Haitian zombies, often controlled by practitioners of voodoo, are probably the most familiar to readers. However, they don’t quite fit in the official definition of a zombie, because Haitian zombies are created through the use of a neurotoxin, generally a tetrodotoxin derived from fish or amphibians. We shouldn’t conflate these “zombies” from true zombies, since they are not a reanimated corpse, nor are they biologically infected by the zombie pathogen. The current wave of zombie epidemics was first documented in 1968, and the consensus is that the Solanum virus is considered the pathogen involved with true reanimated zombies (see Note 4). Modern zombie outbreaks are considered to be infectious and can be transmissible by bite. Oddly, the infection may not be transmitted via simple blood exchange. The Solanum virus has caused most of the known zombie outbreaks across the world. There is no known natural reservoir – that is, animals who host the disease without ill effect – for the pathogen. Importantly, the infection has an almost 100% mortality rate. Patient zero for the Solanum virus infection may have been a child bitten by some unknown life form while looting underwater settlements in the Three Gorges Dam in China. However, zombie expert Max Brooks thinks that the virus has occurred for thousands of years, but outbreaks were self contained because of isolation of humans from one another until recently. Professor Smith also reviewed the history of rage zombies, which don’t meet the clinical definition of zombies, including the widely reported disaster in 2002, which decimated London, England. The outbreak started when an animal rights activist was bitten while releasing chimpanzees from a laboratory which was studying a genetically modified form of the rage virus. This virus has a short incubation period, and the victims become quite quick and strong, thus the infection spread across the UK within four weeks. The British Isles were quarantined from the rest of the world. Twenty-eight weeks into the outbreak, an asymptomatic carrier of the virus caused a second wave of infections, and may have spread it outside of Great Britain. Symptoms of zombie infection are generally uniform, regardless of the particular pathogen. Depending on that pathogen, the development of symptoms can range from a few seconds to hours and days. Some infected individuals will clinically die and reanimate, the standard definition of zombies. Most require nutrition from living human flesh. They do not tend to feed on other zombies. They tend to be very aggressive, especially in seeking nutritional sources. Other symptoms can include a shambling gait, moaning, loss of fine motor dexterity, loss of personality traits, and eventual rotting of their flesh. There are rare cases when the renominated zombie retains a high level of intelligence, is self aware, and may not bite or eat flesh. Despite the wide variety of pathogens that may cause the transformation of a human to a zombie, it almost always requires a bite (see Note 5). There have been reports of transmission of zombie pathogens via insect or animal bites. A medical textbook, The Neuropathology of Zombies , reports of bedbugs transmission of the zombie pathogen in an island outbreak off the coast of South America. An interesting type of zombie pathogens, Cordyceps fungus, has been documented as the cause of a diverse set of zombie phenotypes. Interestingly, they spread via bite or by spores released from dead hosts, so it’s important to avoid handling or touching these type of zombies once they are killed. Unfortunately, the rapid onset of symptoms, and the large size of outbreaks, science has been unable to research and develop effective presentation and treatment. However, there are some anecdotal reports that quickly removing a limb or the general area that was bitten by a zombie may prevent the infection from spreading. However, it may not work with all individuals, especially if bitten by a zombie that has the fast acting type of pathogens. In addition, it may not be possible to surgically remove the bite area. Further research in this area may be required – a meta review would be required before evidence-based medicine should accept it as clinically effective (see Note 6). The cost of development is extremely high, especially with the collapse of economic and social networks that could provide the strategic energy to push research forward. The number of zombie pathogens is so large, that it may not be possible to create one vaccine to prevent all types of zombification. Clinical trials for the vaccine may be difficult, since a failed vaccine or placebo group could be impossible to manage. It may also be unethical to subject a living human, who has the experimental vaccine, to a zombie bite to determine effectiveness. Clinical study design may be very difficult. Antivaccination sentiment may prevent wide uptake of the zombie vaccine, which could mean unvaccinated individuals may have to be segregated from the vaccinated population. Moreover, there may be societal issues in mandating the zombie vaccine for children, because irresponsible parents choose to put them at risk. Lastly, unless the vaccine induces permanent immunity to the various pathogens, frequent booster shots may be required. Vaccines may be our best hope in preventing further zombie outbreaks. As of today, zombie outbreaks are expensive, destabilizing to society and the economy, and are almost impossible to control. Professor Smith has accurately stated that zombie quarantines generally fail, and have proved difficult to contain individuals who are infected but not symptomatic. Zombies can overrun entire geographic regions in a short period of time. The prognosis for a city that has just one zombie enter it is bleak. Most humans will be dead in a relatively short period of time. Isolated and rural areas could survive longer, but as zombies search for human flesh they tend to travel in large packs that will overwhelm even sparsely populated areas. The Centers for Disease Control and Prevention have published details of the preparations that should be made in the case of a pending zombie outbreak. 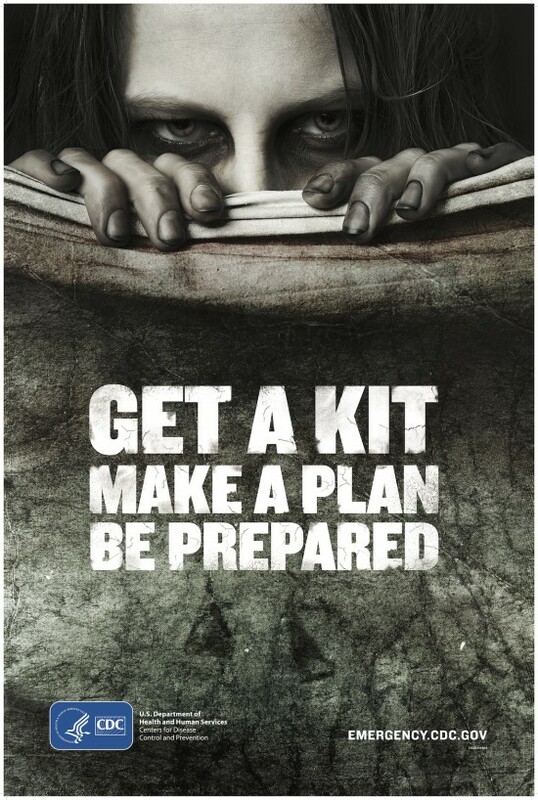 The British Columbia (Canada) emergency information resource has also published information to prepare for a zombie outbreak. Unfortunately, the nascent efforts may not be sufficient to prevent an apocalyptic destruction of humanity. There have been rumors that CDC is investing more resources in this problem than they publicly admitted – we hope that their efforts come to fruition. Zombie outbreaks are caused by several different types of pathogens. Transmission of the pathogens include bites of humans, insects, and animals. However, there are several well developed hypotheses that all humans have the zombie virus and may turn into a zombie at death. There are no well-studied methods to treat zombie bites, short of an immediate surgical removal of the bitten area. Zombie research should include massive resources should be invested in the development, manufacturing and distribution of an effective vaccine against all of the zombie pathogens. We should also make certain that the vaccines are mandatory for all residents of a zombie-free area, Those who refuse must be exiled from that area. Noted zombie expert Matt Mogk notes that rage zombies, which nearly destroyed the UK, are infected, but still alive. There’s still debate as to whether rage zombies are actually zombies. I have interacted with the author of this study on a number of occasions in social media. I will endeavor to remain unbiased in my review of her groundbreaking study. Prof. Smith has declared her competing interests – she is a member of the Advisory Board of the Zombie Research Society but receive no financial or other type of compensation. I accept her claim that her membership has not caused any conflict of interest in her writing this article. Most of the history of modern zombies is derived from Max Brooks’ comprehensive World War Z: An Oral History of the Zombie War , and Brooks and Matt Mogk’s exhaustive Everything You Ever Wanted to Know About Zombies . CDC researchers have proposed a medical condition whereupon everyone reanimates as a zombie upon death. This method was explored in several episodes of the historical series, The Walking Dead, most recently here.